What we love about NetEnt is that they have a knack of taking our favourite franchises and turning them into great slots. 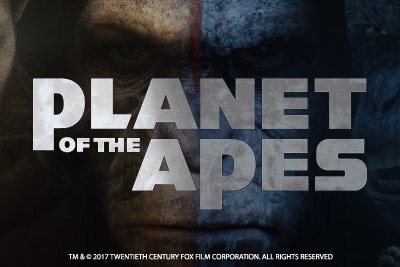 Planet of the Apes brings Caesar back into your life in an innovative dual reel system, which is going to change the way you think about slots games. 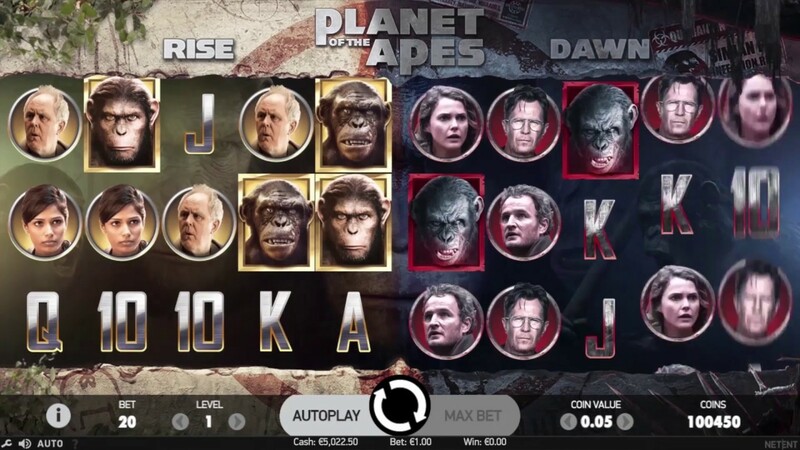 Planet of the Apes is a dual reel system, which means that it offers a split screen game that has 5-reels and 20 fixed pay lines on each reel! The RTP on Planet of the Apes is relatively high too, running at 96.33% for players. Each reel runs independently but can work together during the features to help create bigger wins! One reel is named Rise and one reel is named Dawn, and each one contains symbols and characters in reference to the movie it is named after. As the reels spin, that ominous foreboding soundtrack from the movies plays, adding an edge to the atmosphere. Bet Amounts – Betting begins at just 20p per spin and can go up to the maximum of £40 per spin. When you consider the dual reels and amount of pay lines in play this is pretty awesome. Wild Symbols – There are two wilds in play which is a gold emblem on the left and a red one on the right. They will substitute for all other symbols except the bonus and the scatter. Scatter Symbols – As with the wilds there are two scatter symbols here too. They are a gold rise of the planet of the ape’s logo on the left and a red dawn of the planet of the apes on the right. Landing three or more scatters anywhere on the reels will trigger the bonus features for each reel. The scatters have to be three of each gold to trigger that reel’s bonus or red to trigger that reel’s bonus, it can’t be a mix of the two. Random Dual Feature – Occasionally before each spin and always at random, one symbol from each reel will be chosen. These symbols will now become sticky symbols for one respin of the reels. Here’s the kicker, if the symbol selected on the left appears on the right or vice versa they will move from the one side to the other to help complete wins! Respins will continue whilst matching symbols land, once no new matching symbols have landed the respins end and the game recommences. Rise and Dawn Feature – To trigger this you will need to land either the Rise symbol on reel 1 on the left reels and the Dawn symbol on reel 5 on the right reels. If you do you will receive the matching feature bonus. Dawn Feature – all human and ape symbols will turn into one single matching symbol. Stacked Wilds Feature – This is a great feature that combines both reels. If you land a stacked reel of wilds in the Rise area of the reels, then it will be copied over to the corresponding reel in the Dawn area. Bonus Spins Feature – With there being two separate play areas, there is of course two separate bonus spins games to be activated. Land three gold scatters for the Rise spins or three red scatters for the Dawn spins. Dawn Bonus Spins – 15 bonus spins allocated, with x3 special symbols corresponding to the meters at the side of the screen. Each symbol represents either a multiplier, extra wild or extra spins. As each symbol lands on the reels during the bonus it will fill its respective meter, once full that extra is activated. Meaning you will end up with a huge multiplier or an extra wild on your final spin, or extra spins added to your total. Our mind has been blown! Planet of the Apes was an epic franchise and the slot game has risen to the lofty standards set by the movies. NetEnt has developed an interesting twist on standard game play by splitting those reels. But then having them work together as well as independently to create wins is a feat of genius. Speaking of wins, they happen often and sometimes when you are least expecting them due to the great random features that can trigger. On top of everything else there are animations, video clips and sound bites from the movie, which just made it that little bit better in our eyes.